For years I've been using my own small customization to add drop down control to pages. I used it for cities, states, salutations, etc. After my list grew too large I customized it again to more manageable and a single page. This plugin attempts to do a very similar task to Dean's customization from 2008 (yeah, 2008, I checked). 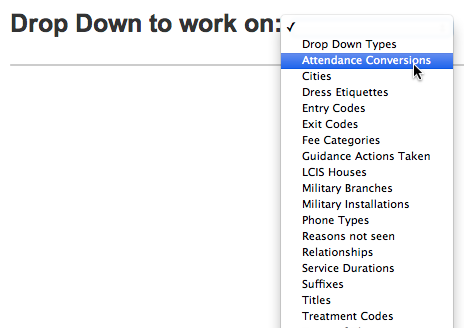 It adds a single link on the district menu to a page that helps manage your drop downs. What's more, you can enter in drop downs that already exist and they'll show up as well. Click New to add a new record to the list or click the list item to change values. Enter a plural and a singular label (ex: Cities and City) so that the display is correct and in context. Enter a unique value in the Value box. This can be something that is already in use if you wish to show an existing list (ex: entrycodes) or a new category. The value here is what will be used in the gen.cat field for the list. If you want your lists to appear in a certain order then you can use the Sort Order field. Otherwise leave it at 99 and they will sort by the value column. Note: Deleting a list from the Drop Down Types menu does not delete all the actual records from the gen table. It only removes it from being managed in this customization. To add an item to the drop down click New. You will need to add a label (ex: New York) and a value you want recorded when users select that option (ex: NY). If sorting is important change the sort order. To edit an existing item click on the item and change the values. Just note that changing the value of the item does not retroactively change the records that item was used on. Find the field you wish to turn into a drop down. If the field already exists on a page it's likely in a text box. In your select tag add the code special="lists.entrycodes" but change entrycodes to your list. This was the unique value entered when setting up your list. Close your select if you haven't already. If replacing an existing text box remove that too. Pearson adds in a single option tag. If you choose to do that too (with no value) please close it. They drive me crazy when they are left open (as all of Pearson's are). For examples go to [your powerschool server]/admin/students/edittransfer1.htmlt in any browser other than Internet Exploder and you'll see the code and several examples. selectEntryCode, selectExitCode, selectDistOfResidence are the closest to what we are doing in the example above. Wihtout a doubt I would start with cities. How can you get correct data if people enter the same city different ways? Take New York City for example. You might find it NYC, New York City, NY City, etc. Next I'd say was states but I found there is a way to do states built in (special="states.usstates") so if you are in the US don't bother making a states drop down list, let Pearson control it. I have tried varies combinations of relationship and relationships in name and *cat, and I've tried Relationship and Relationships, but I get the same thing. Any assistance on the correct syntax would be appreciated. Was there a syntax solution to the previous question showing just description and not value in drop down? for me the key was realising that the start had to be lists.CUSTOM not lists.name of my lists. This is great plugin. Thank you Jason. There are currently 0 users online.